State Assemblymember Nora Campos received an email from Kathleen King, executive director of the Santa Clara Family Health Foundation, that appears to have broken state and IRS laws. The Santa Clara Family Health Foundation was created to help raise money to pay for poor children’s health insurance premiums. In recent years, however, the tax-exempt organization has also acted as a political entity, providing year-round help and coordination to the South Bay Labor Council and Working Partnerships USA campaign organizations. 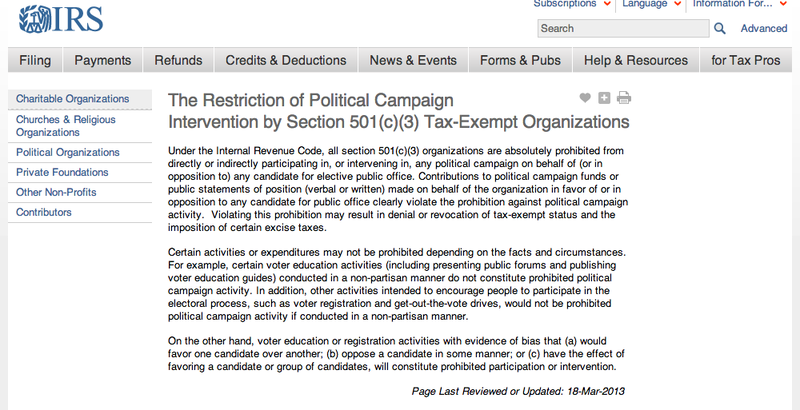 While there are some allowances for tax-exempt organizations to get involved in issue campaigns, nonprofits and public agencies cannot participate in individual candidate campaigns. Kathleen King, executive director of the Health Foundation, has not always followed this rule. A brief footnote in the District 5 county supervisor race last year was King’s bid for the seat. She bowed out in February 2012, and Joe Simitian went on to win the seat in the June primary. But in an email dated Aug. 2, 2011, King wrote a brief letter with the subject line, “My campaign,” to Health Foundation boardmember and state Assemblymember Nora Campos (D-San Jose). In the note, King made an overture for Campos’ endorsement through her Health Foundation email account. The name “Phaedra” is almost certainly in reference to Phaedra Ellis-Lamkins, who was formerly a SBLC employee and executive director of Working Partnerships. She now runs Green For All, an anti-poverty tax-exempt organization based out of Oakland. Ellis-Lamkins was included in another email about Jed York and the San Francisco 49ers, as an SJI commenter noted. King’s use of the public agency’s email to conduct campaign work for herself, an individual candidate, appears to be a clear violation of IRS law on campaign restrictions. It also violates state law (code 8314), as King is considered a public official and she was using a government email address. In an interview earlier this week, County Executive Jeff Smith said he considered the Health Foundation a public agency. While the Assemblymember did not reply directly to King’s email, Campos did endorse King for supervisor. King, in turn, made a $100 contribution to Campos’ 2012 Assembly campaign. “Family Health Fiasco” is a series based on public documents released May 17, 2013, after a court decision by Judge Carol Overton. The documents shed light on how the South Bay Labor Council interacts with local nonprofits and government agencies. Click to read more about the coordinated campaign activities between the Santa Clara Family Health Foundation and local labor leaders. Wow and just when it appeared they couldn’t get any more obvious in the thumbing of the nose at the rules the little people have to live by. who in city, county, state, and federal is not breaking the rules and law. Last national poll shows only 20% trust politicians at all levels. Probably less here with Chuck and his clown council. I appreciate what you’ve done to obtain public records and document the web of links between local government and nonprofits. But is a single email asking a contact for support really such a scandal? In private industry, I frequently use my company email to line up lunch dates or organize weekend outings and those emails inevitably turn into discussions about how they and their families are doing. If I spent hours and hours at it, at some point my company might wonder whether I was getting any work done for them. But as long as I’m not spamming a hundred people from a company account, what’s the real problem in contacting just one person? If Kathleen King had simply logged into her home email account from her agency desktop, then this email might not have fallen under the Public Records Act and we wouldn’t even know about it. Arguably, that could be worse. The interesting thing about that e-mail to Nora Campos, was that it went to a gmail account, and not to an official e-mail account. I’m guessing that King sent it to a gmail account, because she knew that sending it to a government account would make it subject to public records requests. The fact that she sent it from her Health Plan administered account, probably meant that she did consider that account safe from public records requests. I’m guessing that Nora Campos did respond to King’s email, but apparently not back to King’s Health Plan account. I agree with you that from a misappropriation of government resources point of view, this is weak. However, it does give you a sense of how King viewed and used her position at the Health Foundation. I think personal ambition has to be accommodated to some extent in any organization, but when an employee’s ambition takes a back seat to organizational goals, then that is a situation that has to be corrected. The Health Foundation has shown itself to be an enabler with respect to tolerating Ms. King’s use of the organization for her own personal benefit. Can you characterize approving the legal action to block the Metro’s public records request as anything else? The Health Foundation board has to reflect on what they are there for. If they’re they to help poor families and children, then they know what they have to do. The law prohibits the use of public funds/taxpayer resources for political campaigns. Period. No exceptions. If you allow any use of public funds, such as use of a public email address using computers paid for with public dollars and maintaining by staff paid for by public dollars, for political campaigns then where do you draw the line? The law prohibits going down the path of using any public resources for political campaigning. She could have used her home/campaign email account, yes. And she should have. It’s not illegal to ask for an endorsement. It’s illegal to use public resources for political campaigning, which is what she did. There are good reasons why government officers shouldn’t be asking for money or political endorsements from their official email accounts. It’s an anti-corruption practice. Once people can use the authority and credibility of an entity with coercive powers to deprive you of property and personal freedom, the graft will begin. Your IRS auditor will ask you for a donation to support his favorite charity. The passport clerk will want you to sign a ballot petition. And it will be a slippery slide to a folded up bill behind a drivers license at a traffic stop. Beyond that, no public resources, no matter how small, should be used for candidate activity. Kathleen King spent several months running for supervisor while on the payroll and on the clock. Her activity was very broad and egregious, not immaterial. She broke the law. Cindy Chavez did the same thing. She delayed her leave of absence from the non-profit “think tank” Working Partnerships when she declared to replace her buddy George Jr.
Non-profits are paid for by you and me, because they are tax exempt. Our taxes get raised to pay for services because they don’t pay them. In exchange for this subsidy, they agree not to engage in politics, except in very narrowly defined circumstances. The people who commandeered these non-profits to support their runs for office, like Chavez and King, are lawbreakers who need to be prosecuted. > King’s use of the public agency’s email to conduct campaign work for herself, an individual candidate, appears to be a clear violation of IRS law on campaign restrictions. It also violates state law (code 8314), . . .
> A little more than a year later, on Jan. 30, 2013, King was appointed to the State Dental Board by Gov. Jerry Brown. A couple more entries for the “remorse due” ledger. 2. The unremorseful Jerry Brown for appointing a scofflaw to a state board. AS someone previously posted, put a name to who posted this. Don’t be like the Mercky News. Stand behind your posts. Looks like SJI is now nitpicking and being silly. “Non-profits are paid for by you and me, because they are tax exempt. Our taxes get raised to pay for services because they don’t pay them. In exchange for this subsidy, they agree not to engage in politics, except in very narrowly defined circumstances. The only time WE pay for non-profits is when WE voluntarily donate any of our net / disposable income to a non-profit and even then WE get to write off the donation on our taxes. I have said it over and over agian – the majority of these “non-profits” exist for one reason and one reason only and that is to enrich the ceo/head of the Board of directors types. SJI/metro has an agenda – that is clear – hats off to them for Shirakawa and Chavez and the rest – it isn’t what they investigate – its what they don’t and won’t investigate that gives them away. The tax exempt status they enjoy and benefit from comes at the tax payer expense. Their exempted taxes are “covered” by those who continue to pay taxes. The tax payer if FUNDING those exemptions regardless of any ADDITIONAL grants they receive from state & federal monies. Facts are facts and tax exempt entities are on the public dole. No one else makes up that exemption but the individual tax payers. Didn’t Mayor Reed recently get caught misdirecting $100,000 from one group to another that ultimately was for Rose Herrera’s city council campaign? Where is the investigation by SJI into this? If politicians fixed the problem of ballooning pension costs, they might not have money to spend on fun things. Are you against people having fun?